To be honest I’m not the type of person that really likes to rag on people and their ideas. So, when I was presented the opportunity to write this series, I was naturally a bit concerned if it was a good idea or not. However, I agreed and wrote the first post based on a few articles I researched. Well, after looking more into Dave Ramsey’s theories, I’m happy I decided to take part in this project. The guy’s views on many things are absolutely crazy! So, for the next few weeks, I’ll be picking apart his ideas like a buzzard on road kill. Today, we’re going to talk about his insane $1,000 savings idea. What Is Ramsey’s $1,000 Savings Rule? Dave promotes a wacked out idea that if you have credit card debt, you should put a thousand dollars into savings for emergencies. Once you have a thousand bucks saved, you should use the rest of the money you have available to pay down your credit card debt. We All Know That Overwhelming Credit Card Debt Is Bad – We all know that credit card debt can get expensive. Knowing that having an incredible amount of credit card debt is bad makes us automatically want to believe people that give us a plan for paying that debt off! So Why Am I Saying This Rule Is Absurd? Losing Your Job – Finding a job can take a week, it could take 3 months. You never know! If you lose your job today, can you survive for months on a thousand dollars? I know I couldn’t. Emergency Home Repairs – Let’s say your old roof starts to leak. If you don’t repair it, the damage will continue to get worse and worse leading to more expensive repairs. However, fixing a leaky roof could cost thousands of bucks. Under Ramsey’s plan, if this happens to you, you may have to get used to mold spores in your attic while you wait to save for the fix! Death Of A Family Member – Would you feel bad if you couldn’t make it to a family member’s funeral because you couldn’t afford it. Out of state trips will cost thousands in last minute airfare, hotel rooms, rental cars and more! Unfortunately, on Dave’s plan you’d be out of luck! If you’re in debt, you should aggressively work to pay it off! You should also aggressively work to build an emergency fund. However a good rule of thumb on how large that emergency fund should be is to save a minimum of 3 months’ worth of your salary. From there, you honestly should be able to handle any financial hurdle. 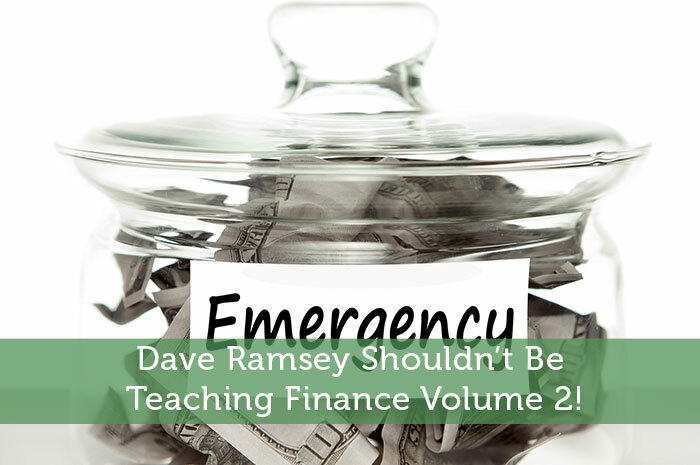 Dave Ramsey Shouldn’t Be Teaching Finance Volume 2! While there are many things I could disagree with Dave Ramsey on, it’s painfully obvious you didn’t do your research before writing this article. He also addresses job loss, longer terms savings separately from the $1,000.00. Here’s something I’ve learned over the years in dealing with the pubic coming from all walks of life and I mean this in the nicest of ways. People can be dumb. They don’t know how to think for themselves and especially with complicated topics like money, they look to someone to give them the answers so they don;t have to look for them themselves. While most people could do better with more than 1k (esp in the US where things are a little more unstable in some areas) it’s something and it gets people thinking about what they really need. It’s a step in the right direction. Think of the population as a whole rather than individual situations. I am not a Ramsey disciple by any means, but I did read “Total Money Makeover” recently just to see what the buzz was about. He does recommend building a larger emergency fund after you’ve paid your debts off. I do agree with you that depending on how deeply you are in debt when you start his plan, that it could be a long period of time that you’re playing with fire with only $1000 in emergency savings. However, as Catherine posted, sometimes you have to take into account the intended audience of his books. If they get to the point where they actually have $1000 in savings, that’s probably $1000 more than they’ve ever had in savings. To me, that’s not enough, but to them, it’s probably quite an accomplishment. I have to agree with Catherine here. While I don’t like some of Dave’s teachings, you have to admit that he has pushed people do take action. His $1,000 savings rule is really for people that have no savings what-so-ever. If you don’t have anything, then $1,000 is going to be much better for you. He has to bring his advice down so everyone can understand it. When we speak, we are talking to a different audience. His audience is typically in real need of advice that they can easily take. Most people will never get out of debt if they are just saving for an emergency fund. I like percentages. I think maybe put $1,000 in the Efund before starting with CC payments. But then, rather than putting everything towards CC payments, start contributing a portion to the debt and a portion to padding the emergency fund. Dave gets people to act. Action is what its all about. Are his ideas perfect? Of course not. Whose are! Let’s continue the discuss about how much is a sound emergency fund; but remember its easier to add to an existing savings plan than to start one from scratch. The fact that we are having this discussion is a good thing, in itself. I can’t wait to here more comments. I think the only real alarming thing about Dave Ramsey is that his intended audience doesn’t seem to question him at all. I think it would be much healthier if he was the catalyst to a financial education besides just being a “to-do list” to get out of debt. I think he has a place in personal finance because plenty of people do just need a “here’s step 1. Do this” approach to begin to get anywhere. Assuming the debt you’re paying off is credit card debt, and for the last many years most people seeking his advice have been in credit card debt, you could always tap the available credit you’ve freed up on your cards by paying down the balance, once you’ve exhausted your $1,000 in savings. But that only applies to credit card debt, and if your account is still active. Most people I meet anymore are in massive student loan debt. This wouldn’t be good advice for them. I hope he’s making it clear this advice is only for people with maxed-out-but-still-open credit cards. Factually speaking, Denise is correct. Student debt is now the second largest category of consumer debt, behind only mortgage debt. It has grown bigger than credit card debt, auto loans, home equity lines and all other forms of debt. It is also the category with the highest rate of default. If your debt is credit card debt, it makes more sense to me to pay that down and when an emergency strikes, use the amount you’ve paid down. If, by good fortune, no emergency strikes, you’ve gotten rid of an extra $1,000 in debt. I like a balance of paying off debt and saving for an emergency at the same time. When I was in credit debt, after my bills, I took 85% of the remaining cash I had to pay down my credit cards and the other 15% to savings. It worked for me – I made a big dent in my debt and covered myself in case of an emergency. I fully agree that having $1000 in an emergency fund is not going to get you very far. I agree with Stephanie and Jon (in your comments) – using a percentage of your income to put into savings and paying down your CC at the same time makes a lot more sense than only focusing on the debt repayment. If Dave Ramsey is able to help people that are in desperate situations get out of them, then great, but the more I learn about him/his teachings, the more concerned I get that people are going meet his goal (which is supposed to be a starting point) and then stop. So for example, as soon as they have $1000 in their EF, they are not going to save anything beyond that, when clearly they should be. For the vast majority $1K as an E-Fund won’t likely cover much but for a lot of people who are starting at ground zero in terms of personal finance and debt repayment it’s a target to shoot for that is not overwhelming and can be done relatively quickly. The idea of a quick win is psychologically motivating to us humans and it often serves as fuel to carry onward. Once they achieve that first $1K, they should set a new target that will see them through most situations when Murphy decides to visit. I definitely agree with you, and the $1,000 savings would definitely work with someone who virtually has no savings but not for people who have managed to handle their personal finances very well. Someone who managed their finances well for any length of time isn’t going to need Dave Ramsey’s advice. The $1000 is simply a beginning, not a goal. Most people would freak out at the prospect of saving 3-6 months income in an emergency fund. They might find $1000 is doable. It is a start at least. Um, I don’t think you read all of the Dave Ramsey steps. I am not his biggest fan either, but the $1K that he advocates is not a full emergency fund. The point of it is to get people out of the habit of turning to credit when everything comes up. Yes, lots of things will cost more than that, but having to replace a cracked windshield, or a small trip to the vet, can be covered. If you’ve got 20K in credit card debt, you’ll have paid more in interest than the mini-mergency fund in a few months, plus you’ll free up available credit, plus cash flow if you need it because yor minimum payments will be lower. Please research things more thoroughly prior to editing, especially if you are advocating a position that is even more ridiculous than what you are criticizing. Dave doesn’t say have $1000 for all emergencies. He stresses starting out with $1000 to at least have something saved for emergencies and then to start your debt snowball. I’d read more into his plan before criticizing in which case you’d probably not have written this article. I’m new to the world of personal finance and am working to pay off our family’s significant credit card debt. I came across many Dave Ramsey disciples as I started on this journey, so I’ve been reading his books during the last month. (One thing I’ve learned: There’s no need to read them all, as there’s significant overlap between them.) There are a number of things about him with which I’m not completely comfortable, and the $1,000 “baby step” is one. I agree that for many people this is a large amount to save and an important first step. What worries me specifically, is just how insignificant an amount it is. Obviously everyone’s situation is different, but I agree that $1,000 will not go very far under certain emergency circumstances. It’s not even a full mortgage payment for my family, and that worries me greatly. That being said, I do respect Dave Ramsey for motivating a lot of people, from all walks of life, to take control of their finances. For people who feel lost and need structure, his approach can be very helpful. If $1,000 to start is a bad idea, what then is a good idea for Emergency fund? I think starting off with a $1,000 allows two things to happen, it creates an easy “baby step” that can be obtained by many if not virtually all of the population and that builds confidence. The second thing it does is allow the excuses to go away when you attack your debt(like Ragnar Lothbrok), the “new tires”, “car broke down”, “emergency room visit” occurrences. You are focused on paying off debt now. The $1,000 emergency fund worked for me. It took us a year to pay off all of our debt (except for mortgage), and not once did we need to use the emergency fund. I was nervous to have such a small safety net, but it worked. I think part of the reason it worked is because I was extra motivated to find alternative ways to earn quick cash if we needed a little extra money — if I had a large emergency fund, dipping into it for non-emergencies would have been easier. After paying off our debt we started on our full emergency fund (as Ramsey advises), and it’s almost fully funded. I don’t agree with him on absolutely everything, but I think this particular advice is sound. I’ve got to respectfully disagree here. Yes, $1,000 is relatively low. But it’s a great starting point – especially if you’re deep in credit debt and other loans. Sure, it may not be enough for when one loses their job. But I’d rather have “only” $1,000 in my emergency fund with $0 minimum payments on other debt rather than having a bigger emergency fund but still have obligations to credit card companies and the like. Dave Ramsey is first and foremost promoting Dave Ramsey – books, seminars, his “local providers (whose main qualification seems to be paying him fees)”. I think the biggest problem with Ramsay is his religious nuttery. People outside of the United States just WILL NOT take advice from someone who talks to their imaginary god friend. It makes this guy look like a loony. I listened to his audiobook and could NOT take a word of what he said seriously, because of his constant religious twaddle. The entire rest of the world is watching America’s decline thanks to these nutjobs. Taking Dave Ramsey’s Financial Peace University changed our lives and our relationship with money. I agree with you — $1,000 is not enough for a real emergency. However, I don’t think you worked all the way through his course. Yes — Step 1 is the emergency fund — save $1,000 as fast as possible. This get’s the ball rolling. Step 3 — 3-6 months expenses in savings – this covers what you are talking about. You may want to get all your facts before writing — I see you have a Finance Blog — sorry, but you just lost big credibility by having wrong info.